Swag it on your motorcycle or your Laptop. 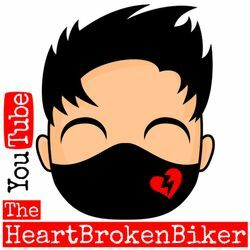 This sticker means you watch "The HeartBrokenBiker" on YouTube and you ride safe, sensible and you are amazing! You can also be proud that you&apos;ve helped some charity, because part of sticker money will be donated alongside my usual charity donations. NOTE- Please mention your address, phone number and email correctly while buying stickers. You can email me on heartbrokenbiker@gmail.com if there is a problem on instamojo while buying. Thank you.